Banking on our enriched industry experience, we are able to offer a wide gamut of Log and Antilog Amplifier. These high performing Log and Antilog Amplifiers offered by us are non-linear circuits, in which the output voltage is proportional to the logarithm (or exponent) of the input. We take into account the ever changing requirements of different industries and offer innovative range of products. Thus, these products are widely appreciated by our clients. 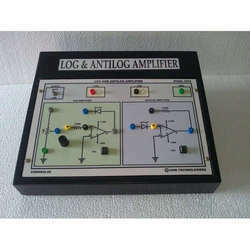 Looking for Log And Antilog Amplifier ?